With over 100 stores nationwide, Tile Giant is a leading provider of tiles to both the trade and DIY markets. As one of the many arms of the Travis Perkins Group, Tile Giant provides thousands of lines to suit all styles of homes and budgets. After several years of trading with a Magento 1 website that was in desperate need of a facelift, Tile Giant approached iWeb to develop a brand new solution to help transform their online offer built on Magento 2. With multiple considerations required in order to boost their omnichannel presence, push conversions through the website and drive footfall to stores - Tile Giant’s latest website developed with iWeb is packed full of custom integrations and features to overhaul their customers’ online experience. Any business that pairs a large product range with multiple touchpoints where customers can purchase will find managing inventory a struggle. On the Magento 2 platform, we’ve been able to implement an end to end integration with Tile Giant’s in-house EPOS system and carry out product updates, order exports, shipments and click and collect notifications to ensure a seamless transfer of information across their entire stores, warehouse and ecommerce network. 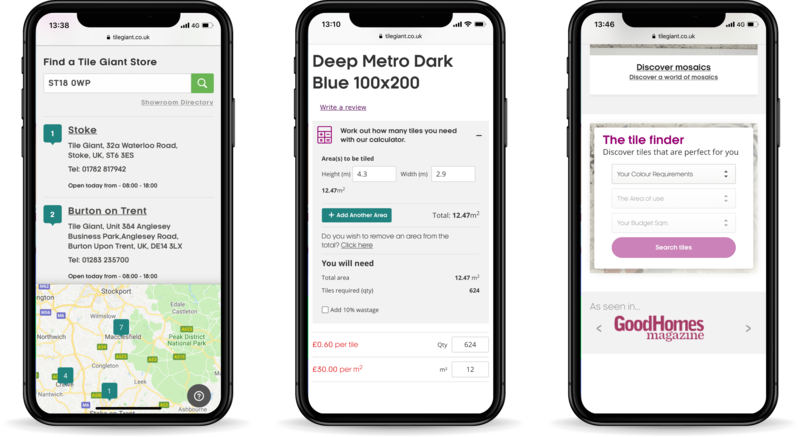 Even though the majority of online sales are fulfilled through an extensive courier service, for those customers wanting to pick up their orders in any one of Tile Giant’s 100+ stores, we developed a seamless click and collect functionality to help customers complete checkout with ease. In line with their plans to build on their omnichannel presence, we’ve implemented third-party marketplace integrations for Amazon and eBay. Managing inventory levels and syncing with their internal systems is even more integral to ensure that orders are not allocated stock which has already been despatched. A catalogue of nearly 5,000 SKUs needs to be easy for users to search. The sophisticated Searchanise integration helps to do just that with popular suggestions, autocorrection and results for both pages and categories to help users in all stages of the buying process. With so much choice on the market, finding the ideal tile for your home can be daunting. We created a custom tile finder widget filtering by colour, usage and budget to take the strain out of finding the perfect product. Tile Giant have always provided the option for customers to buy full-size tile samples but now, for the first time, the option to buy cut samples has been rolled out. Using bespoke logic and attributes, the free of charge cut size sample service will help to drive more sales and clear all-important storage space. With over 100 stores across the UK, it’s essential that customers can easily find their nearest Tile Giant branch. We created a custom store locator, powered by a Google Maps API, with a comprehensive showroom directory to present all the essential information for each store. To help customers purchase the right amount of materials they’d need to complete a job we created a custom calculator to sit on each product page. Measuring the height and width of a wall or floor and taking into account the product dimensions, customers are now able to plan their purchases more accurately and even include an additional 10% for any potential wastage. Now built into the core of Magento 2, Dotdigital is easier than ever to implement and create email automation that truly convert. From basic abandoned basket workflows right through to bespoke landing pages and web behaviour tracking, Dotdigital provides Tile Giant with actionable insights at every step of the customer journey. Customer reviews are always an essential part of eCommerce, and using Yotpo for product page reviews and a real-time feed of all service and product feedback in key areas of the website helps visitors place their order with confidence. With a new content marketing strategy in place with our sister company Kanuka Digital, all of this material needed to be housed on the new site. The Blog MX extension from Mirasvit makes it easy to show off the latest styling trends and featured products with a user-friendly WYSIWYG editor and responsive design to suit all devices.